Today I’m excited to announce the launch of my latest venture, Connected. Connected is a personal relationship manager that brings your contacts and conversations together in one place. It integrates with Facebook, LinkedIn, Twitter, Gmail, Google Contacts, Google Calendar, and Google Voice to make it easier than ever before to stay on top of your most important relationships. I learned early in my career that the story of success in almost every business endeavor starts with relationships. Maybe your buddy introduced you to a potential customer that became a landmark deal. Or an executive at your company championed your project due to the rapport you had built with him. We’ve all seen examples of this happen throughout our careers. Yet how many of these situations feel serendipitous? And are we really maximizing our ability to create such opportunities? After spending considerable time with folks who I consider successful networkers, I’ve realized that while the tactics they employ may differ, they all regard social capital as one of their most important assets. And they take the time to build, maintain, and leverage their social capital just like the rest of us do with any other kind of asset. Unfortunately the tools we employ today to manage our relationships are rather abysmal. In an earlier era you’ll remember that executives or sales guys often had a carefully guarded rolodex that they viewed as one of their most prized possessions. Yet today we have no equivalent. While social networks like LinkedIn and Facebook have enormous potential in maintaining a vast network, they are insufficient and in fact have exacerbated the problem. We often now end up spending our time simply reading and responding to the folks that bombard our feeds and inboxes. Being so accessible today makes it much more difficult to focus our time and efforts on the relationships that matter. 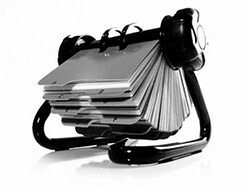 My goal with Connected is to build the modern day equivalent of the rolodex. And this time make it accessible to the rest of us that aren’t born networkers nor have the time to constantly manage it. Connected brings all your contacts and conversations together in one place. It does this automatically so you don’t have to waste time with the basics of building and updating your address book. With integrations into email, social networks, calendar, and phone, Connected is able to build a comprehensive view into all of your relationships. For every contact you can see your entire conversation history, including last email, last phone call, or even last in person meeting. While it will be some time before Connected supports all available services, today it supports a popular subset, including Facebook, LinkedIn, Twitter, Gmail, Google Contacts, Google Calendar, and Google Voice. Connected gives you the most complete picture of your contacts by integrating data from across the social web. Your contact’s profile automatically includes their latest status updates, photos, work history, mutual friends, and so much more. Instead of manually scouring the web to stay up to date on a contact’s latest happenings, Connected does the work for you. Connected makes this data actionable to you on a daily basis. Every morning Connected helps you prepare for your day by sending you an agenda of all your meetings and everything you want to know about the people and companies that are attending. In addition, Connected helps you stay in touch by discovering opportunities to reconnect with your network. You’ll never miss a birthday, job change, or other important event again. Connected also lets you quickly see who you’ve lost touch with and even set reminders that proactively notify you when you haven’t talked to someone recently. This is just a taste of the functionality Connected provides to help you build stronger relationships in less time. While many folks could benefit from Connected, it is optimized for those of us that are in the business of relationships. That includes sales, biz dev, executives, recruiters, investors, real estate brokers, and much more. It is these folks that feel the greatest pain today without adequate tools to support them. But as with any startup, I’m eager to see who Connected takes hold with and expect to be surprised by what we find. I hope this gives you some insight into the vision for Connected. Today’s launch represents just the first step in making it a reality. If you are interested in following this journey, Get Connected Today.